Our latest room reveal is here!!! 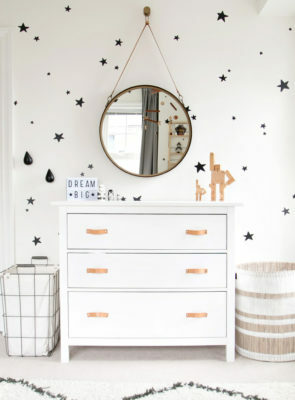 I am SO excited to share our newest project, little client Miles’ monochrome nursery!!! This house may look familiar to you; Miles’ baby room is right next door to Ella’s toddler room (his older sister) that I shared a couple of years ago. 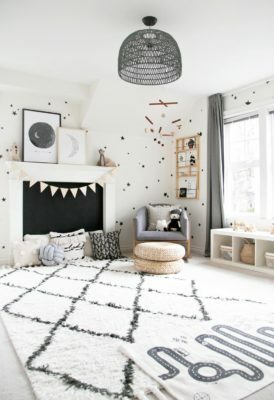 Miles’ room is our take on a monochrome boys’ room. The entire space was based on black and off-white but we wanted to keep the overall feel light and airy with lots of natural wood touches. 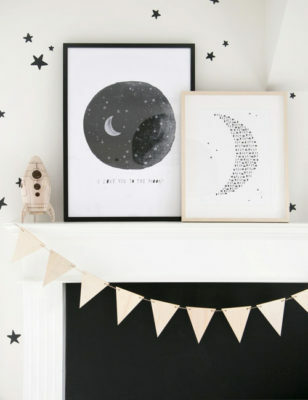 Stars always feel fitting for a kids room; and this room has nods to space in the ‘I love you to the moon’ print, the ‘dream moon’ artwork and the rocket nightlight too. Miles’ space is set up to be a dreamy place to sleep but also a perfect place to play. As Miles started to move, the fireplace became more and more of a point of interest and safety risk. 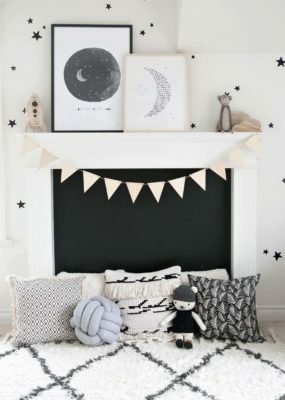 The chalkboard cover (just a piece of plywood painted with chalkboard paint) works perfectly to add such a special detail and covers the fireplace well, keeping little fingers out. I can’t wait to hear how much fun he has with this feature when he actually finds out he can draw all over it! Pillows are perfect for setting up cosy spaces for little ones to relax. I love this knot pillow so much as it not only looks amazing but is lots of fun for babies to grab as well. It functions both as an accessory and toy, which is ideal. Isn’t the polar bear adorable too? He’s so soft and such a sweet softie to grow up with. The mirror over dresser is still one of my favourite set ups for kids. Kids LOVE mirrors and this one will last for so many years to come. I can absolutely see Miles liking this mirror as much as a teenager as his parents do now. Miles’ mom didn’t want to have a change station as by the stage we designed the nursery, he was wiggling around too much and diaper changes were being done on the floor. 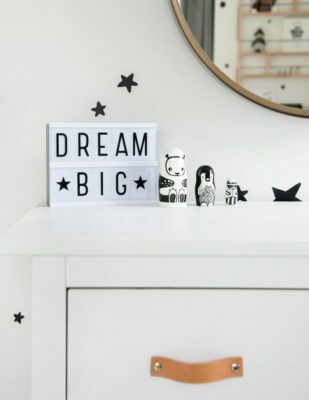 I love how small details like the light box and little nesting dolls add a playful touch when decorating kids’ rooms. The key is using items that are both educational and decorative so (at least) two functions are covered off in one item. 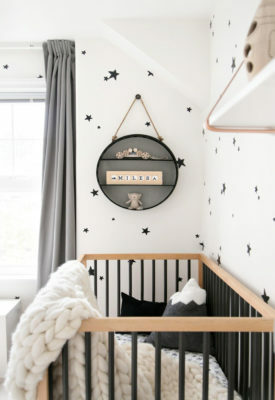 I don’t know what side of this nursery is my favourite but the crib corner is sure up there! 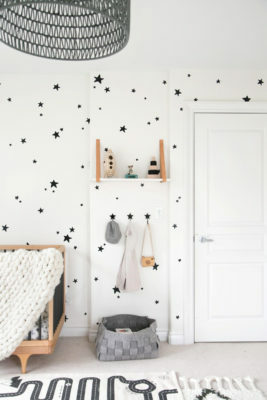 It’s simple but dreamy and the star decals provide all the magic the wall behind the crib needs. 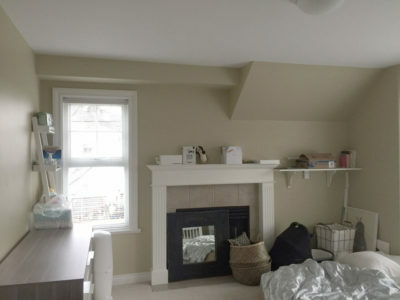 For those who like to see what the room looked like before, here is a photo of the space when I first arrived. It’s always amazing to look back on where we started! 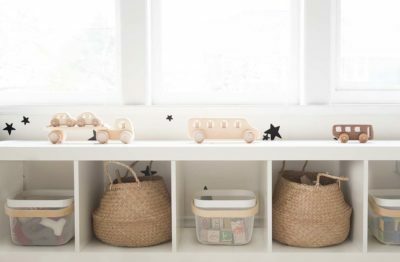 Just like in sister Ella’s room, Miles’ mama wanted a little shelf with hooks beneath it right by the door. It is such a functional set up for providing a landing place for sweaters, etc. when you walk in the room and helps to keep the space tidy.